I encountered a dangerous, dismaying situation while I walked along Aberdeen Avenue last night. The sidewalks are being repaired along Aberdeen in the vicinity of Kent St. I'm grateful that the city takes the maintenance and repair of sidewalks seriously, but the state they left them in during repairs is unconscionable. On the north side of Aberdeen, the sidewalks were impassable because they were covered with tarps, presumably because they were recently poured and the concrete was still wet. 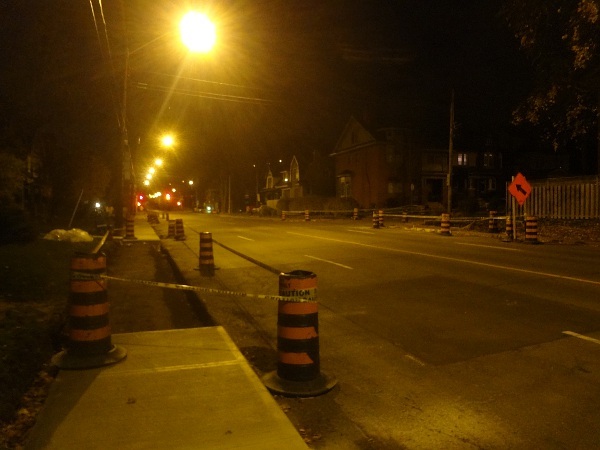 They were blocked off with pylons so pedestrians wouldn't inadvertently stumble onto them. On the south side, the sidewalks were removed and excavated, presumably because new concrete will be poured there soon. Where the sidewalk used to be was a sort of berm of gravel bordered by ditches that were approximately two feet deep. 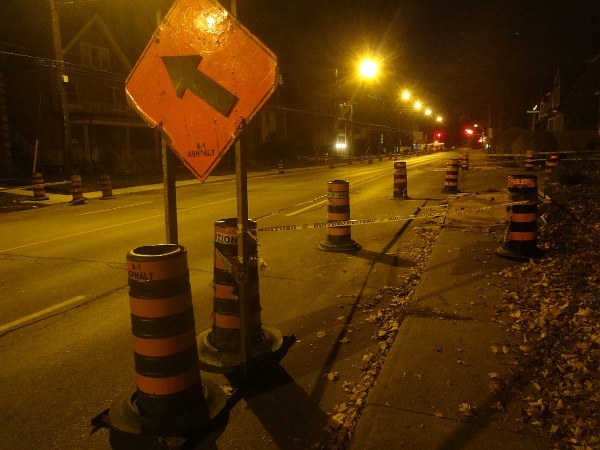 Again, the sidewalk was blocked off with pylons, to indicate to pedestrians not to walk there, or perhaps to indicate to drivers not to drive into the makeshift ditch. Aberdeen Avenue near Kent with sidewalks blocked off. I was able to traverse the south side excavation, but I'm able-bodied and at the time I didn't have my kids with me. People pushing strollers, people with mobility challenges, the elderly, people driving motorized scooters or wheelchairs would have only one option: step out onto Aberdeen, a busy four-lane road, and walk down the street. How is this even legal? Indeed, what would the city's legal liability be if someone were struck by a car and seriously injured or killed because someone made the absurd decision that it was okay to remove both sidewalks on Aberdeen from service at the same time? And once that decision is made, how is it possible that no leeway on the roadway is granted to pedestrians in order to safely traverse the dangerous area? I believe this is negligence of the worst sort: the kind that puts the health and safety of human beings at risk. The risk is especially great for our most vulnerable populations - the elderly, the disabled and young children. It's disgraceful. The best thing that can happen is for the city to start being held legally responsible for negligence in such matters. At any workplace, if injuries occurred because safety features were not respected or omitted, there would be liability and fines. Cities need to start being accountable for things they CAN do but DON'T. 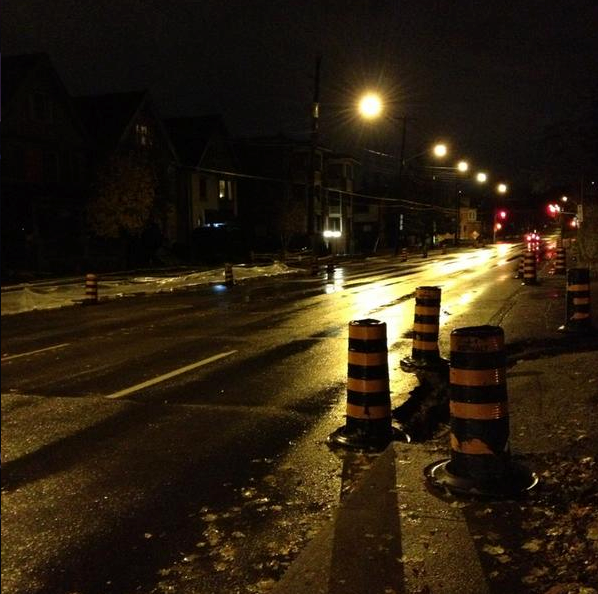 A good example is the continuing fight over Jarvis bike lanes in Toronto. The stats showed a 89% reduction in collisions after the bike lanes were put in. Now, those that work and live on Jarvis, travel by bike, and cannot avail of an alternate route, will be placed back in danger. People injured because of negligence of safety features should start including the city in their lawsuit. I don't advocate a lawyer-paradise-sue-everybody type of culture, that is awful, but is there not some way to hold cities responsible for negligence when steps they could have taken to improve safety are not taken? It needs to start hurting the bottom line when people get mowed down by cars because of shoddy road design. And removing all sidewalks on a residential street? That absolutely should be illegal. If they need to tear up both sidewalks at the same time, they should close a lane, and clearly mark a 'pedestrian detour'. For some years, the City has quietly maintained a policy of allowing painted but unsignalized crosswalks to fade away, on the grounds that if a pedestrian is injured crossing a crosswalk that is not signalized, the city could be liable. But here's the thing: every intersection is a legal crosswalk unless expressly signed otherwise. In other words, the phantom crosswalks with no markings are still legally crosswalks, and drivers are still supposed to stop for pedestrians. The city assumes that drivers won't recognize and follow crosswalks, and so eliminates them by attrition on the assumption that pedestrians won't recognize them either. IANAL but as far as I'm concerned, this creates an inherently dangerous situation that actually increases the city's potential liability through negligence in maintaining legal pedestrian crossings - not to mention reducing the intrinsic walkability of our streets, with all of the public health, safety, environmental and economic problems that go along with reduced walkability. This morning on my commute, I saw an elderly man cross Garth to get to a bus stop. The closest traffic light was a few hundred meters in either direction, so he crossed at a side street. He waited for a break in traffic and started crossing. But he walked very slowly with his cane and did not make it across before the next 'wave' caught up. He looked scared and caught helpless standing in the middle of the street. I was cycling along and saw the whole thing. The car in front of me in the right lane stopped to let this this man cross and I was relieved (bless you for stopping). I stopped behind the car. We were happy to let this man cross safely. In the left lane however, the cars veered into oncoming lanes in order to race around this old man, rather than yield and let him finish crossing. My heart lept into my throat because for a couple of seconds I thought I was going to witness this man get hit by a car, and I was already reading the license plate of the car that veered into oncoming lanes. Now, keep in mind, there was plenty of time for traffic to stop safely, one car did, the other chose not to. Drivers are not aware of their responsibilities at unmarked intersections. This was a bit of an odd occurrence, this man would probably have been nailed for 'jaywalking', and my heart broke at this sick urban design we have going here. I'm afraid to post this comment because I know what kind of responses are coming blasting anyone who would dare inconvenience the motoring public in order to cross the street and catch a bus. Again this was kind of an odd occurrence where an elderly man was not fast enough, and it would have been painful for him to add a few hundred meters to his slow walk in order to cross at a light, but in a polite society it is no big deal to slow or stop and allow a fellow countryman to cross safely to reach a bus stop. Zebra crossings are awesome but the culture here has a lot of maturing to do still before we can have nice things again. Zoom zoom!! I'm afraid to post this comment because I know what kind of responses are coming blasting anyone who would dare inconvenience the motoring public in order to cross the street and catch a bus. You seem to be unfamiliar with this site. Welcome to RTH. This is not thespec.com or thestar.com or any other newspaper website where angry commuters froth with rage about anyone who isn't a lead-footed motorist. More par for the course for Hamilton. Victoria Street has been dark comedy for some time - the sidewalks on both sides where it crosses the train tracks were ripped up for an absurdly long time - one side is still long gone. I'd love to hear an explanation why these things get left half-finished for so long. I could totally understand why the work under the road took most of the year, but after the road was re-built they seem to be taking a dog's age to finish up the sidewalks and asphalt. Same question goes for the unimportant bike lanes on the King/403 bridge that were gone for over a year (looks like we've got a new bidirectional protected bike lane on Main/403, so I can't really complain...). And yeah, I got an angry glare and inaudible shouting from a motorist for crossing with my kids at King and Paisley last night... she was turning, from a stop sign, and apparently decided that her car makes her more important than pedestrians in spite of this. This city is consistently ridiculous. I just drove by there and they have blocked the sidewalk but the big orange pylons are blocking off one lane in each direction and making it available to pedestrians. That was quick. It is nice that they corrected the oversight so quickly! I've phoned the city for other things (e.g. sidewalk in front of our house had buckled and heaved up at the seam, making in inaccessible and hazardous to boot) and had them seen to pretty fast-- a quick, polite phone call often takes care of things. Everyone please be safe. The carnage continues. Toronto is almost a warzone for commuters. Drive carefully, cycle carefully, look both ways when crossing the street, show consideration and patience for your fellow citizens in public. People, wonderful healthy active people, are getting killed constantly. I want to cry right now but converted that emotion into this comment, for what it's worth. There can be many sources of 'fault' for a serious accident, but I reiterate, it is past time to start holding someone accountable for negligence with proper safety features for multi-modal transportation in cities. As of early this morning, there is a pedestrian walkway framed by pylons on the north curb lane just west of Queen, but then the street becomes impassible to pedestrians farther west. There was hardly any vehicular traffic when I walked by this morning, so I was able to walk on the street. That won't be practical later this morning when most pedestrians are about. It was pretty scary last night walking the dog...as I thought the tape meant no walking. So I ended up on the road with the dog and then a skateboarder coming from the other direction as well as vehicular traffic. There was a bit of street mambo going on with the car providing lights for the "dance floor"...not an ideal dance scenario!